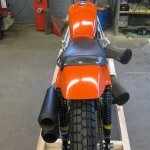 For Sale: 1980 Harley-Davidson XR 750 New! As predicted, interest was very high in this bike. It was priced properly, and a lucky bidder won it using the Buy It Now feature set at $35,000. Fortunately, these bikes are not completely unobtainable – for example this pre-XR model XLR-TT is available via Bonhams auction. Good luck to the bidders! Whether you are an aspiring racer, an avid collector, or just somebody that loves to see cool motorcycles, CSBFS brings you this great 1980 H-D XR-750 in unraced and unmolested condition. Pointed out to us by a sharp reader, this unrestored bike is an stunning example of an iconic competition model from The Motor Company. 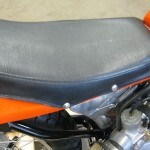 1980 XR-750 unused, in storage for 30 years! 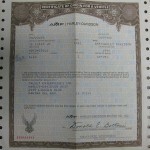 A rare opportunity to own a piece of American 2 wheeled history! The XR750 Harley Davidson motorcycle is the most successful competition motorcycle ever produced, though for many it’s most famous as the Harley Davidson motorcycle that jump hero Evil Knievel used for his stunts. 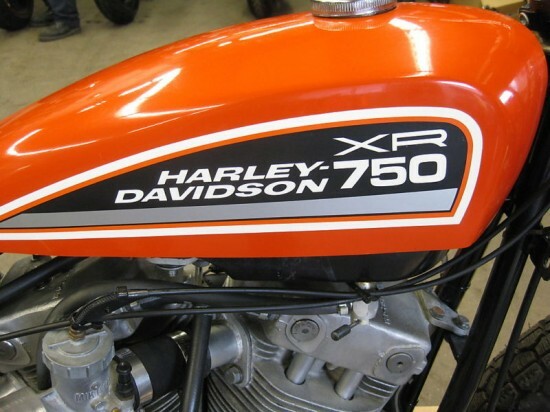 The first XR750 Harley Davidson motorcycles were introduced in 1970 with iron barrels and heads that failed miserably, so a revised alloy engine version of the XR750 Harley Davidson motorcycle was introduced two years later. 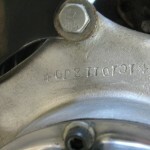 For the first time on a production Harley Davidson motorcycle, the rear cylinder had a forward-facing exhaust and a rear-facing inlet port.The bike won the AMA Grand National Championship in its first year and, upgraded and improved over time, it is still winning races more than thirty years later. 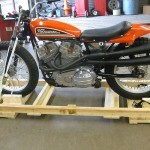 The XR750 Harley Davidson motorcycle has a 45cu.in V-Twin producing ninety horsepower. The four speed transmission and low weight of 295 pounds contributed to the XR750 achieving a top speed of 115mph. 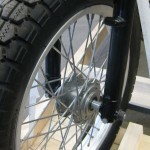 The standard Harley Davidson frame was replaced by most racers seeking a competitive edge and alloy rims and sprockets helped to keep the weight of the XR750 as low as possible. 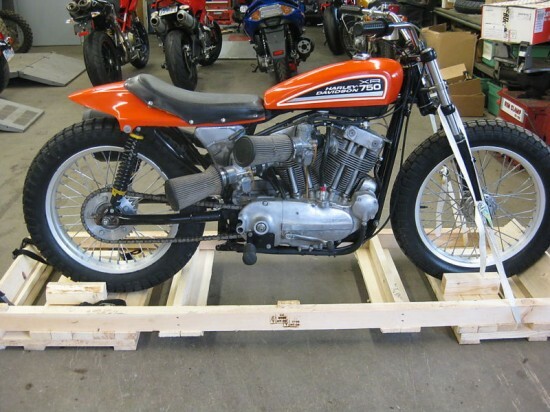 This Harley Davidson motorcycle is generally acknowledged as one of the best dirt-track race bikes ever produced. This bike was originally purchased from Harley Davidson West in 1980 and has been in the same owners possession since 1980. It was started and driven up and down the street a few times when new in 1980, then the fuel was drained and it has not turned a wheel since. You will see that by tghe pictures. It is not a restoration and though it is technically used, it has virtually no use and has never been raced or tracked at all. It has been in the cellar! Everthing is as it came out of the crate. Also included is a disc and a N.O.S. 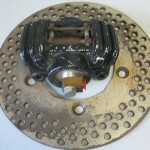 Performance Machine caliper that was to be used to install a rear brake, but this was never done. there are no brackets, lines, master, hardware etc. but you are welcome to it. Dirt track racing – American style – is the only competition venue where H-D really excels. Sure, there were the boardtrack racers in the beginning, and the hillclimbers of the early years, but those were not really factory efforts, and racing was yet to be commoditized. 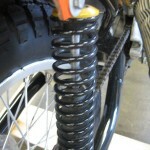 H-D has tried to go roadracing on a few occasions, and has failed to impress. 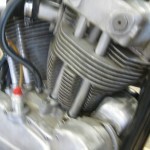 With the XR-750 Harley found instant and lasting success. Save for a brief period in the 1980s when both Yamaha and Honda made bids for the crown, these XR-750s have been ruling the ovals with relatively little competition. From this XR-750 buyer’s guide came some pretty interesting information. These bikes have very good collectability and in some cases parts availability is still not a problem. To quote the guide in terms of values: Expect to spend in the neighborhood of $20,000 – $25,000 for a current competitive bike and over $30,000 for perfectly restored, or factory racing history examples. This bike, in its unrestored and relatively unused condition, certainly meets the latter criteria. Fun Fact: Evel Knievel utilized the XR-750 for many of his famous stunts.
. Tell ’em you saw it on CSBFS! I also have a 1980 XR-750. The bike has been raced in the past but very little.It sat in a harley dealers back room for years and then was bought buy a friend of mine and kept for 10 more years. I bought it from him and ran the bike only to find that it had a collapsed lifter. I disassembled the bike and went completely thru the engine, and set-it up for a street bike with lowered compression ratio using cylinder spacers and longer pushrods and a full speed oil pump. 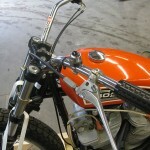 I machined and installed a sportster kick starter and sportster clutch. This bike has never been juiced and is fresh and ready for someone that wants the ultimate street brawler. Title work has been done. 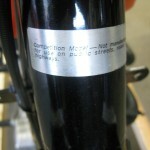 This bike can be bought for $22,000.00 along with the stock parts. In response to Al Hodge post above, how can you be contacted?